The Liars Club: IT'S HOPPER TIME! John and Lee McGarity joined me for a day of fly fishing on Noontootla Creek Farms today. As we made our way into the first pool of the day, John spotted a fish rising. We watched closely to try to see what she might be eating and the only bugs we saw were little yellow sallies. 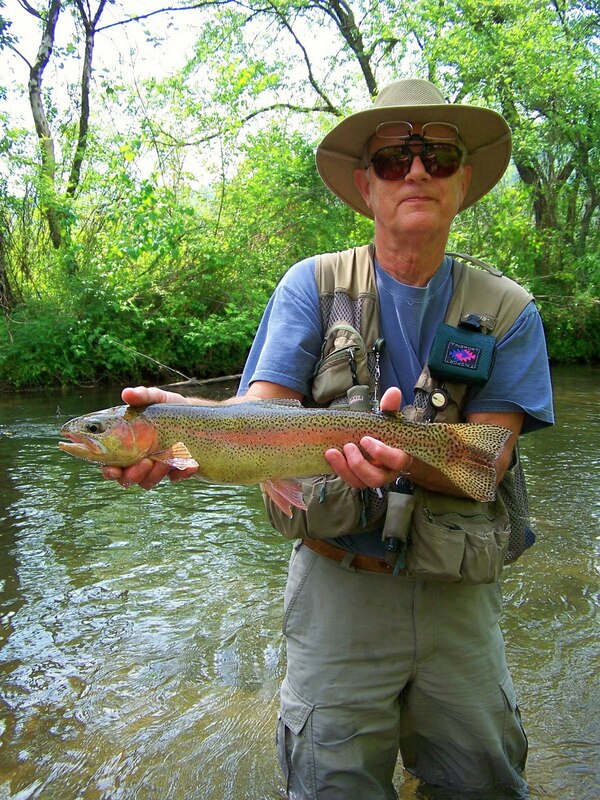 John pulled out a stimulator and made his way below the fish and a few drifts later the trout rose crunched the fly and after a brief tussle spit the fly and was gone. Lee was tossing a nymph rig to start with and got a couple of strikes but no hook-ups. Then a few minutes later someone flipped the switch and they caught fish or hooked up in pretty much each piece of holding water for the rest of the morning. Lee scored big time with a 23inch pig that took us downstream on a scalding run that would have gotten Norman McClean's attention. A big olive bugger was on the breakfast menu and the fish loved it. After lunch with the increasing temperature and the number of hoppers bouncing around in the grass, we shed the waders and strapped on a couple of terrestrials with a nymph dropper. We were not dissapointed. Lee and John were right at home tossing big dries and made some incredible casts resulting in some beautiful bows' coming to net including this 22 incher which was the last cast of the day. It's Hopper Time on the farm! Come and get em'!